Richard H. “Rick” Trentman, a resident of Milford, former resident of Livonia, native of Detroit, and retired credit manager from J.L. 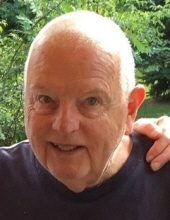 Hudson in Detroit, died on August 21, 2018 at the age of 85. He was preceded in death by Carolyn, his beloved wife of fifty-four years in 2013, and is survived by his daughter, Cathy (Lee) Sommers; grandchildren, Patrick, Elizabeth, Joseph and Kathleen Sommers; brother, Don Trentman; sisters-in-law and brothers-in-law, Lois Greening, Cathleen Hasse, Carl (Mary Beth) Schoeninger and William Soloy. Mass of the Resurrection will be celebrated at St. Mary Our Lady of the Snows Catholic Church, 1955 E. Commerce Rd., Milford, on Thursday, September 6, 2018 at 11AM. Visitation will be held at the church from 10 AM until the time of Mass. Burial will follow in St. Mary’s Cemetery. Memorials may be made in his name to the Society of St. Vincent de Paul -Detroit. For further information please contact Lynch & Sons Funeral Directors, Milford, at 248-684-6645. "Email Address" would like to share the life celebration of Richard H. Trentman. Click on the "link" to go to share a favorite memory or leave a condolence message for the family.